The Culture of Mongolia has been heavily influenced by the Mongol nomadic way of life. The nomadic way of lifestyle is still practiced today in the rural areas of the country. 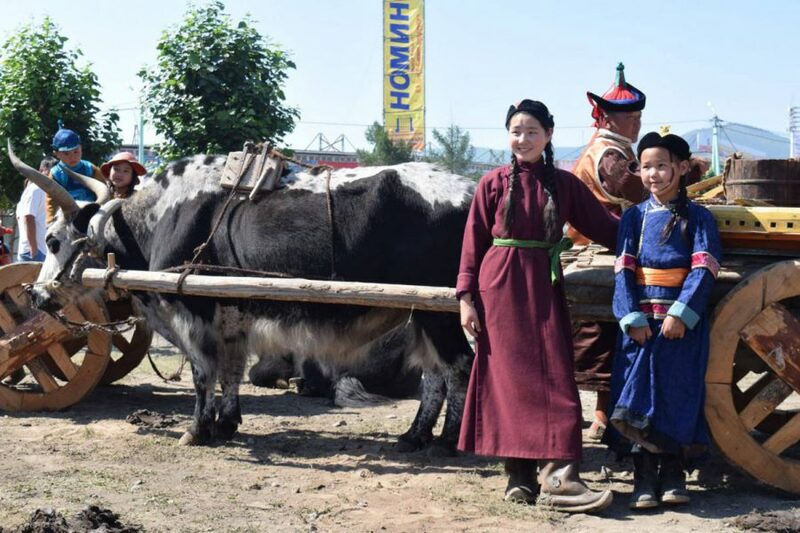 Nomads follow a seasonal routine raising and breeding the five main types of stock – goat, sheep, cattle (including yaks), camel and horse, migrating from place to place following the most favorable pastures and campsites. Other important influences are from Tibet and Tibetan Buddhism, and from China. Since the 20th century, Russian and, via Russia, European cultures have had a strong effect on Mongolia. Other Religions– Mongolia also has a small Muslim community — about 6 per cent of the population. These are mostly ethnic Kazakhs living in the far west of the country. The unique traditional singing style is known as or long Urtiin duu or long songs. It is one of the most ancient genres of Mongolian musical art, a professional classical art of the 13th century. Urtiin duu involves extraordinarily complicated, drawn-out vocal sounds. It has philosophical style, evocative of vast, wide spaces and it demands great skill and talent from the singers in their breathing abilities and guttural singing techniques.